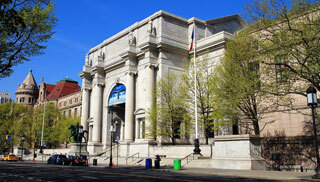 The American Museum of Natural History (abbreviated as AMNH) is one of the largest museums in the world. Located in park-like grounds across the street from Central Park, the museum complex comprises 28 interconnected buildings housing 45 permanent exhibition halls, in addition to a planetarium and a library. The museum collections contain over 33 million specimens of plants, animals, fossils, minerals, rocks, meteorites, human remains, and human cultural artifacts, of which only a small fraction can be displayed at any given time, and occupies more than 2,000,000 square feet (190,000 m2). This article uses material from the Wikipedia article "American Museum of Natural History", which is released under the Creative Commons Attribution-Share-Alike 3.0 License.